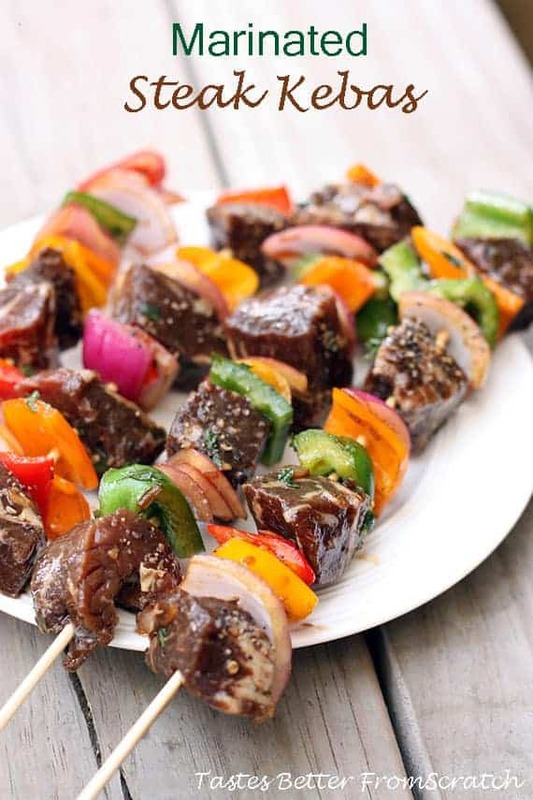 Marinated steak kebabs that can be grilled with any of your favorite vegetables. When we moved to St. Louis we rented an apartment on the third floor. It has worked out great for us, for the time being, but the one cooking tool I’ve missed most is a grill! Last summer we didn’t have one at all! It was the worst! We’d cook burgers on our George Foreman. It was soo sad. We grill several times a week, and one of my absolute favorite, EASY meals is kebabs! 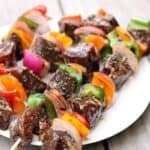 It takes all of two seconds to whip up the marinade for these Steak Kebabs and it’s even easier to grill them! Use any veggies you like…but please make sure to include some bell peppers…and onions. I would have thrown on some big ole’ mushrooms but my husband can’t stand them. And I can’t have a BBQ without some yummy grilled corn on the cob on the side! I also like to make a few chicken kebabs (like these yummy Teriyaki Chicken Kebabs), to go along with the steak. And I make a few plain veggie ones as well! Hey, as long as you’ve got the grill going, you might as well! 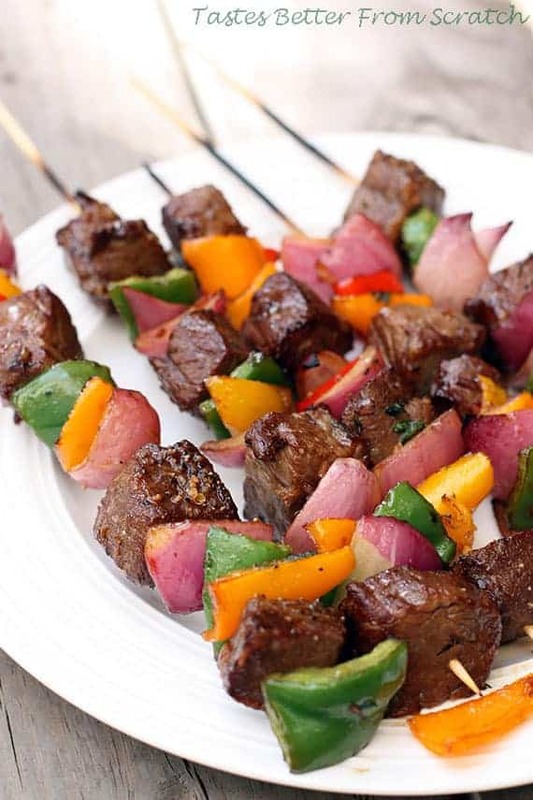 Hope you love these Marinated Steak Kebabs as much as we do! And keep the marinade recipe around–it’s my favorite for steaks. Especially Flank Steak! In a large contained combine soy sauce, juice, oil, dried onion flakes, garlic and fresh ground pepper. Whisk well to combine. Add steak and vegetables and allow to marinate in your fridge for several hours or overnight. Thread the steak and vegetables onto the wooden skewers, keeping a little space between each piece. Grease your grill. Grill the kebabs on high heat for just a few minutes on each side (8-10 minutes maximum), according to how well done you like your meat. Allow the kebabs to rest for 5 minutes before serving. 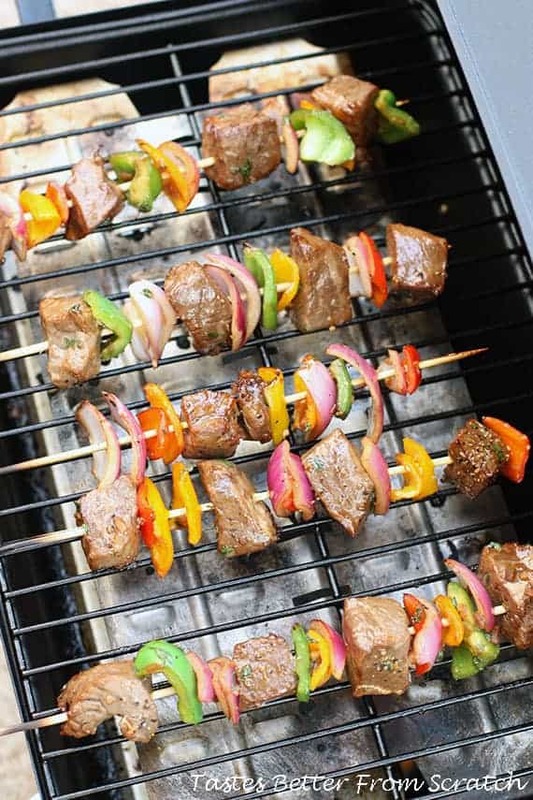 *Soak your wooden skewers in water for 10-30 minutes before putting the meat and veggies on. This will help the wood not to burn while on the grill. This recipe looks fantastic! Cannot wait to try once the weather gets a little nicer!